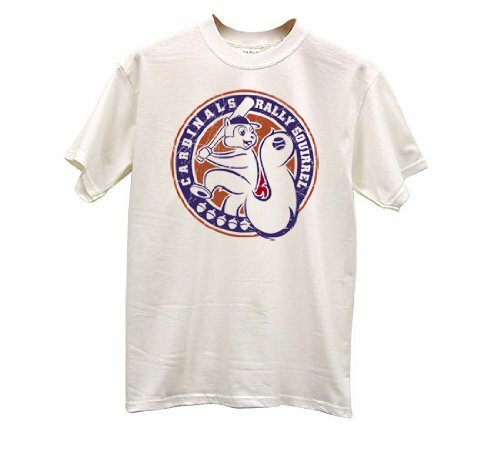 This Cardinals Rally Squirrel Shirt shows a cute cartoon squirrel playing baseball. Blue and red weathered design adorned with acorns is great for showing your support for the Cardinals, squirrels, and baseball! Available in men, women and youth sizes. If you're not yet familiar with the Cardinals Rally Squirrel, we're happy to help educate you. The Rally Squirrel is an American Gray Squirrel that lives on the St. Louis Cardinals' home turf. It acquired national fame when it ran across the home plate during an October 2011 game between the Cardinals and the Philadelphia Phillies. Shortly after, it became the team's unofficial mascot, in part because of the teams subsequent rise to win the World Series that year. Some just love the darn little critter. Others believe he brought good luck to the team. And some, like us, just think he makes one handsome squirrel shirt.